Who has their eyes on Nui’s ice-cream? Our good friend in Angola, Robyn Fox, came up with the idea of the (bag of) rice challenge – instead of wasting precious water in Angola and doing the ice bucket challenge Robyn suggested donating a bag of rice to someone instead. A wonderful example of thinking outside the box and being ‘innovative and proactive’, maybe we will see a GC Award submission from Robyn in the near future… an exemplar global mentor! I was nominated by Sarah Travis-Mulford to do the rice challenge after she had made her of rice to the Hand to Hand Foundation. I have also been encouraging my two oldest children to do the ice bucket challenge ever since I nominated them in Sukhothai a number of weeks ago when I did the ALS ice bucket challenge – they have managed to avoid it all around the north of Thailand and Laos! 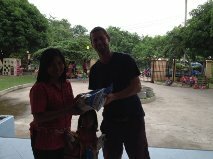 Today they dipped into their own pocket money though and instead of suffering the shock of ice cold water agreed to buy a large bag of rice each and both chose to donate it to our friend Khun Nui. We spent a lovely lunch and afternoon with Nui; Jonah’s highlight being ice-creams and Zoe’s having her hair washed and blow dried!You can read Jonah’s version of his rice challenge here. He has now nominated: Morgan Howard, Ben Harrison and Nampetch Bennett for the rice rice challenge (see my nominations below). 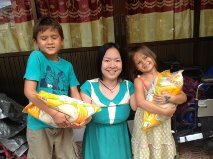 I actually took my bag of rice to the Fountain of Life Children’s Centre last week and gave it to Kru Wannee. I did explain to her what it is all about and I think she understood, I am sure it will all be eaten up and enjoyed either way. Now it is my turn to nominate three people for the rice challenge and I choose: Karen Partyka, Sego Mokgothu and Sara Menges. Three people in three different countries (Scotland, South Africa and the US), it will be interesting to hear back from them and finding out how they got on and who they have passed the rice challenge on to. This entry was posted in Community Partnerships, Innovative and Proactive, Paul Crouch, Service Learning, Sustainable Thinking and Action and tagged ice to rice by Paul Crouch. Bookmark the permalink. What a wonderful idea! Great job Guys!